We started Paleovalley to make improving your health and nourishing your body with nutrient-rich superfoods simple and hassle-free. Right now we're offering up to 20% off our best-selling Organic Supergreens . Right now we're offering up to 20% off our best-selling Organic Supergreens . 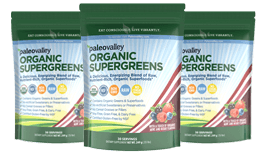 We created Paleovalley Organic Supergreens to make getting a full spectrum of organic superfoods, loaded with nutrients, into your body faster, easier, and at a fraction of the cost of buying every superfood individually. Our Organic Supergreens contains absolutely no cereal grasses. Virtually every other greens or superfood powder on the market contains a heavy dose of cereal grasses such as wheatgrass, barley, oat, or rye. Unfortunately, because humans cannot properly digest grass, buying a cereal grass heavy powder is like flushing money down the drain. Even worse is these grasses contain a lectin called wheat germ agglutinin (WGA) which is highly inflammatory. It has been found to interfere with proper insulin signaling, vitamin D absorption, and is implicated in the development of autoimmune disease. Certain experts believe that WGA may be as responsible for the health-damaging effects of wheat as gluten, and many who are gluten sensitive also have issues with WGA. Our Organic Supergreens only contains organic superfoods that your body can actually absorb and utilize. WHY OUR ORGANIC SUPERGREENS IS BETTER? Our Organic Supergreens is crafted using the highest quality and antioxidant-rich superfoods! Every superfood is certified organic meaning they are non-GMO as well as free from harmful pesticides and herbicides. Don't settle for other products containing conventional ingredients that have been sprayed with chemicals and irradiated. We don't use cereal grasses because we care about health over profit. While cereal grasses are cheap for manufacturers to put in their products, they are not ideal for humans and can have negative effects. If you see wheatgrass, barley, oat, or rye in a superfood blend you should run the other way. We only use true superfoods that are beneficial to the human body and leave the grasses for the cows! Paleovalley Organic Supergreens won't just keep your gut happy because of what we don't put in (cereal grasses) but also what we do put in. We added a wide array of digestive enzymes to help you break down and absorb all of these amazing nutrients optimally. We love making healthy products...but even more we love making healthy products that taste delicious. Our Organic Supergreens is the best tasting superfood product you will ever try. It is a refreshing, energizing drink that tastes so good you would never guess it contains 19 nutrient-rich, health-promoting superfoods. A micro-algae that is 60% protein by weight and contains all essential amino acids. Spirulina is loaded with iron and vitamin K as well as other pigments with antioxidant properties. and eliminate them from your body. Contains over 90 trace minerals that are incredibly health supportive. Compared to other common fruits, apples ranked second highest in antioxidant activity. Apples have been associated with decreased risk of chronic disease. A sea veggie that is an excellent source of iodine and has been shown to be a potent anti-inflammatory, improve blood glucose levels, and slow cancer growth. A powerful detoxifying superfood that helps your body eliminate unwanted metals and toxins. An antioxidant and nutrient-rich powerhouse. High in potassium and vitamin C and may lower your risk of heart disease and cancer. It also has anti-inflammatory properties. Far more nutritionally potent than whole broccoli and contain compounds that accelerate the body's ability to detoxify from various environmental pollutants. A superfood from the sea high in iodine and potassium content, plus a long list of micro-nutrients and phytochemicals. A superfruit common in ayurvedic medicine and rich in vitamin C and antioxidants. Known to enhance food absorption, fortify the liver, nourish the brain, support the heart, help eliminate free radicals and toxins. Contains 65 times more vitamin C than an orange. The antioxidants and vitamin C contained in acerola helps boost the immune system, strengthen the liver, improve skin and improve your body's ability to regenerate tissue. Contains a digestive enzyme called bromelain, which is a mixture of proteolytic enzymes and works to help your digestive system break down and absorb proteins from the foods you eat. Research has shown reishi to promote longevity by boosting immune system function, promote liver cell regeneration, and have neuroprotective properties. Loaded with nutrients and bioactive compounds that have powerful benefits. Known to help stabilize blood sugar, fight inflammation, improve digestion and more. Antioxidant and phytochemical rich powerhouses. High in potassium and vitamin C and may lower risk of heart disease and cancer. They also have anti-inflammatory properties. Contains powerful antioxidants called mogrosides which have been shown to help fight free radicals, cancer cells, inflammation, fatigue, and diabetes. Antioxidants in carrots, including beta-carotene, may play a role in cancer prevention, inflammation reduction, and eye health. Also strongly associated with positive cognitive benefits. Studied have shown that the anthocyanin found in raspberries provides anti-inflammatory benefits that may help the heart. Also shown to help improve blood flow. Quite possibly the most powerful, natural, anti-inflammatory food on earth. Each bag is a 30 day supply and we recommend taking advantage of our bulk discount pricing so you can save more today. If you have not been eating a nutrient-rich diet up until now we suggest considering taking more than the suggested one tablespoon dose in order to get more nutrients into your body faster. Also, when you order 3 bags or more you will receive FREE shipping and handling. What are the ingredients used in Organic Supergreens? Yes, on orders of 3 bags or more you will receive 100% FREE shipping and handling. Do you use any flow agents or fillers such as rice flour or magnesium stearate? No absolutely not. We do not add any flow agents or fillers to our products whatsoever. You get the highest quality ingredients handled with the utmost care...nothing else. If you compare the amount (by weight) of actual superfoods you get in Organic Supergreens with other products you'll notice that most others are primarily made up of cereal grasses and cheap fibers. Yes, our Organic Supergreens does mix easily...especially considering that we do not use any flow agents in our products. The best way to mix is to pour the water into your glass first, then pour in a tablespoon of Organic Supergreens, stir and enjoy! Simply take 1 tablespoon with water. Easy as that! You can also get creative and add Organic Supergreens to smoothies and baked dishes. 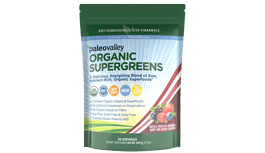 What is the difference between Paleovalley Organic Supergreens and other similar products? There is really no comparison. Virtually all other greens/superfood products are comprised primarily of cereal grasses such as barley, oat, and wheatgrass and nothing more than a dusting of other superfoods. Cereal grasses are nearly impossible for the human digestive system to breakdown properly and are best left eaten by ruminant animals such as cows who have 4 stomachs designed to digest these grasses. Cereal grasses also contain a lectin called wheat germ agglutinin (WGA) which is highly inflammatory and has been found to interfere with proper insulin signaling, vitamin D absorption, and is implicated in the development of autoimmune disease. While other products may have a less expensive price tag it is important to understand that, with the vast majority of them, all you are getting is a glass full of indigestible cereal grasses that can have similarly damaging effects as gluten. 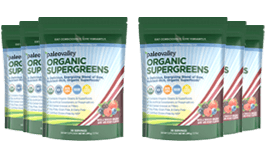 We created Paleovalley Organic Supergreens using 19 nutrient-rich, organic superfoods that your body can actually utilize and absorb. We also gently dry each superfood in order to preserve as many of the fragile nutrients as possible. Plus, we added digestive enzymes to help your body to break down and assimilate the nutrients so you are getting the maximum benefit out of each amazing superfood. And last but not least, Paleovalley Organic Supergreens is the most delicious greens drink you'll ever taste...we guarantee it! While we don't make any claims that Organic Supergreens will turn you into a superhero overnight, it was created to "work". This is a product that contains real, whole food, nutrient-rich, organic superfood. our Organic Supergreens, simply by subscribing!